For this lovely Art Tuesday, I want to talk about comics. I am not sure why, but comics seem to have a really bad reputation for being stupid or sub-par to novels. This is not the case. Before I was introduced to comics, I though similarly. Sure, there are pictures. But comics are not like picture books for children (although I’m sure there are comics targeted to children). Majority of the time, the vocabulary in comics is on par with most higher level novels. Page Out of Harley Quinn: Preludes and Knock-Knock Jokes by Karl Kesel, Terry Dodson and Rachel Dodson. All rights go to DC Comics. This page comes out of Harley Quinn: Preludes and Knock-Knock Jokes by Karl Kesel, Terry Dodson and Rachel Dodson and is released by DC Comics. I particularly love Harley comics because while they are a little nutty, due to the antics between Harley, Mr. J (Joker) and whoever else navigates around them, the content provided is always top-notch and Harley comics, among others, provide vocabulary that is better than your average boring newspaper or teen novel (not knocking the Hunger Games (which I love) or Twilight, but this, in my opinion, is better). Children, teens and even adults can read comics. Why not? If you click and read this page, Harley is talking to Lewis about how he got involved with Mr. J and Lewis tells Harley to guess; the second panel from the top reads: Harley: “You wanted to be a clown, but you had to join the military to pay for clown school. During a routine invasion, you were exposed to an experimental nerve gas that left you allergic to grease paint. Embittered, you rejected all authority and turned to a life of crime. And I like to think you killed a man — it’s the romantic in me!” While Lewis’ story is not so melodramatic, Harley’s monologue about his back story is filled with depth, even though it still has a hint of nutcase in it. The addition of the nerve gas seems like the introduction of any super hero story. ‘They were harmed by xyz and came out better because of it…’ But I digress..
Not only are comics great because of their vocabulary, but they’re fun! 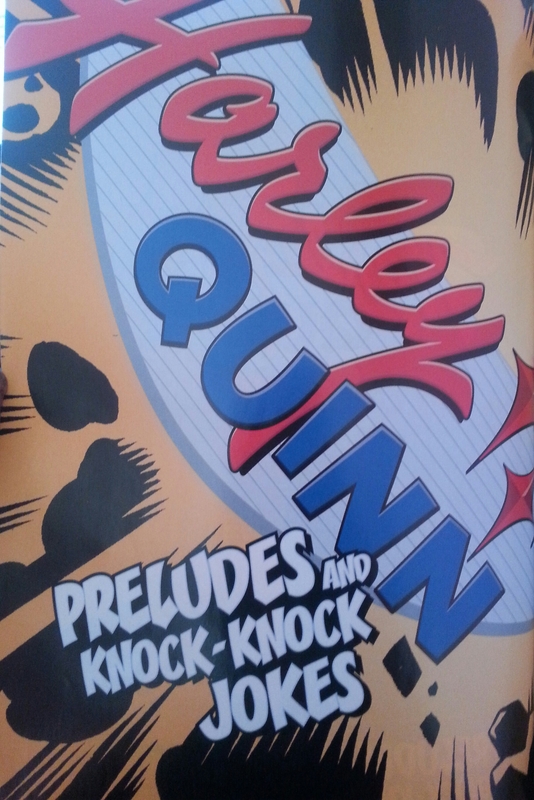 Inside Cover of Harley Quinn: Preludes and Knock-Knock Jokes Written by Karl Kesel All Rights For Ownership goes to DC Comics. Here’s hoping DC does more with Harley than just comics and takes the cake from Marvel by producing a female led Harley flick.